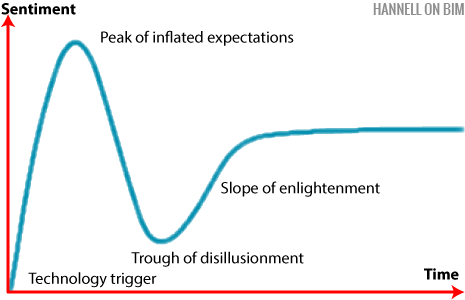 BIM - Trough of Disillusionment or the Valley of Reality? An online article by Andrew Hannell , titled “BIM & the Gartner hype cycle” prompted me to write about my observations on the status of BIM in the construction and facility management sectors. In Andrew’s article, he describes The Gartner Hype Cycle as a “technology maturity pattern, where high initial expectations are followed by a trough of disappointment, before recovering to a level somewhere below “the initial expectation”. The graph below explains. — Building owners are somewhere at the ‘Peak of inflated expectations’, asking for something BIM. While I can’t comment on the UK, I can certainly see clear evidence that Australian and NZ designers are taking to BIM and 3D design in increasing numbers. Research and discussions with designers confirms productivity benefits like clash detection and the ability to insert detailed objects without costly drafting. 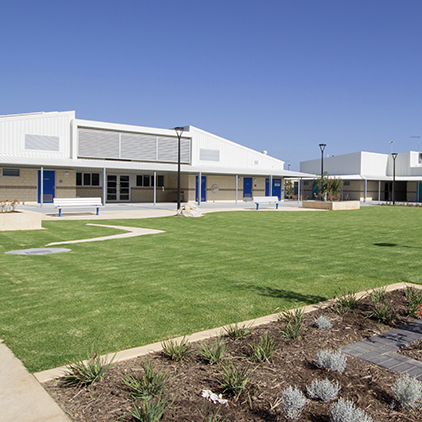 University studies indicate 9% savings in RFI and site re-work from BIM designed projects. However, for the construction industry, it’s a different picture. A review of a number of BIM projects in construction revealed over 90% of the documentation are 2D PDFs. So why are contractors content with 2D drawings? Is it because BIM files are too complex and large, is there a lack of training or is the software too expensive? Perhaps it’s because an experienced contractor can visualise a 3D image from 2D plans in seconds without software and has the added ability to provide 4D information like method, timing and staging. Perhaps contractors have bypassed the ‘Trigger’ or even the ‘Peak of Inflated Expectations’ and moved to the ‘Valley of Reality’ using common sense and a practical approach. For building owners, we have seen a reduction in demand for all things BIM. Again, is there a sense of reality taking hold? BIM in design is not singular but multiple files, such as the Architectural, Structural, and Mechanical etc. Asset data contained in BIM objects is not in a readily usable format, and is cumbersome to transfer into the owners existing asset systems. For many owners, new works rarely equate to more than 5% of the total existing asset portfolio, which means that 95% of the asset data is not BIM. As for facility managers, one FM cheekily said, ‘Where’s the value? I get 3D now because I can see it, 4D because I can hear it, 5D because I can touch it’ and so on. Another aspect of BIM that is often overlooked is the ‘narrative’ that’s needed to explain both the design development process and, at construction completion. While iterative BIM models may plot design progress, there is no narrative to explain why certain decisions were made. Additionally, at construction completion, the various BIM files are unlikely to supply the critical ‘narrative’ required under Work Health Safety regulations to provide ‘accessible’ information to safely operate and maintain the new facilities, nor could the multiple BIM models provide the asset data to match the clients existing systems. So where does this leave BIM? In the design phase, it has certainly demonstrated its value in 3D drafting. The software to extract spatial and elemental quantities for estimating is well underway, however 2D PDFs are still the preferred method for construction. In FM, there’s a lack of a clear cost benefit to change 95% of the current data into BIM. In conclusion, to move from the ‘Valley of Reality’ the BIM industry will need to ascend the ‘Slope of enlightenment’ by dare I say, using the “stairs of common sense”. It might mean changing the focus from forcing business processes around software to recognising the value of human experience and intellect, especially in the practical arts of building and maintenance where it needs to be simple to use and adds real value.